Part two of our two part travelogue. Wednesday 26th. November. Evening, Among other things Castilla y León is famous for roast suckling pig and lamb and in the City of Segovia, synonymous with roast suckling pig, the famous restaurant El Mesón de Cándido is renowned the world over having been visited by the worlds royalty, politicians and stars of entertainment for a century and more. Testament to these visits, being their beautifully preserved photographs and signatures adorning the walls. No visit to Segovia would be complete without experiencing Cándido’s and so it is that we all arrive promptly at 8.30pm to a warm welcome into this unique period building nestled under the Roman Aqueduct. Originally an inn from 1786 it has been run by the Cándido family since 1905 (4 generations) being remodelled in 1941 within the Guidelines of Architecture and Fine Arts and is listed in the inventory of artistic monuments of the city. We are ushered to the Don Álvaro de Luna dining room on the first floor where we indulge in the canapés, Jamón Ibérica, Chorizos, Queso Zamorano and fine wines while we admire the views of the aqueduct from the windows and explore the paintings, photographs and signatures on the walls. Seated at the table we are treated to an excellent starter course of a variety of young vegetables braised and wrapped in Jamón in the style of lasagne before the main event. 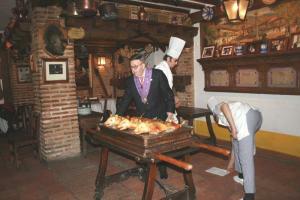 The chefs arrive with their rack of still roasting suckling pigs followed by ‘The Greatest Innkeeper of Castile’. 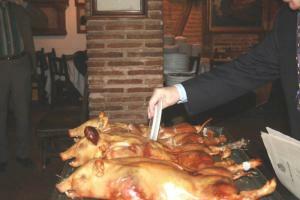 The present Cándido wearing his medals of honour commences the ritual welcome bestowed on all visitors to Castile and after due ceremony he carves the piglets with the edge of a plate in the famous tradition of his father before him who some of us remember from over 20 years ago. Dessert and then the finale of the flaming, mint liquer waterfall called Hipocrás together with coffees. However after, there is plenty of time to enjoy the atmosphere, the opportunity to speak with Sr. Cándido and be presented with a personally autographed booklet of the inn’s history. Well fortified with wine and good food we all walked back to the hotel after an altogether momentous evening always to be remembered. Thursday 27th, and a slightly earlier start to the day, we are travelling the 120 kilometres to the fabulous city of Salamanca. 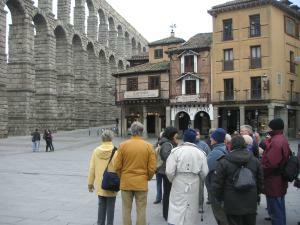 We leave the coach and walk across the Roman bridge over the River Tormes to the ancient heart of the city. Here we firstly visit the two Cathedrals Old and New with their entirely different architectures, a mixture Baroque with Romanesque, The main entrance with its recently refurbished carvings and intriguingly sporting the small but slightly irreligious astronaut added by a mason in the late 1990’s on one of the ornately carved entrance pillars. All the interiors and exteriors well described, as usual, by Maria. She then leads us off to the ancient University, one of the oldest in the world, founded in the year 1218. 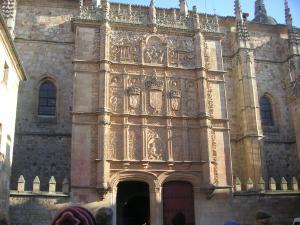 She describes the famous “Plateresc” entrance façade before entering to see the austere classrooms and especially the room used by the famous monk Luis de León. After passing along the Rua Mayor past the House of Shells with its stonework façade moulded into the shape of scallop shells we end up at the Plaza Mayor, the magnificent main square with arches and the painted heads of all the kings and queens of Spain above the arched perimeter. Four terraces of wonderful architecture, perfectly balancing and flanking the original Ayuntamiento building. Purported to be the finest city square in Spain. Time for lunch in restaurants of our choice and a browse before making our way back to our starting point and the coach for our return journey to Segovia. A bitterly cold day, but, thoroughly enjoyable. Friday 28th and a little lie-in as today’s excursion starts later. Although individually we have all seen much of Segovia during the previous days and including the cathedral, today Maria meets us at the hotel and is taking us on a short walking tour of the city starting with the fantastic Alcazar. This amazing fortress sits on a pinnacle of rock and has its origins during Roman times and these foundations can be seen in the under croft. 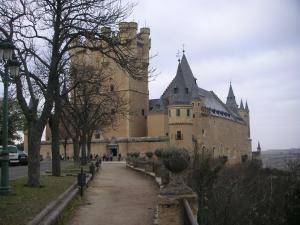 The building we are seeing dates from the Middle Ages and developed until the 18th century. It is beautifully preserved and contains many important artefacts and works of art including amazing suites of armour etc. The whole was brought to life by Maria’s narrative throughout. Most of the morning was taken by this visit but we did walk back to the main city square via the old Jewish quarter where the various artisans traded and lived. Free time for lunch here (and for some a little window shopping) before Maria who had visited her mother during this time rejoins us and we are off down to see the Aqueduct at close quarters. This enormous construction was completed in the 1st.century A.D. and served to take water from the springs at one side of the valley, a distance of some 3 kilometres, to the Alcazar on the other side. Renovated in 1999 the channel can still carry water to this day. We are dwarfed standing underneath it. How was it built? How did they excavate and cart the huge stones there? How did they lift them into position? How did they actually survey the site and get the levels so accurate. Well, Maria explains all these questions, and more. As this is the last time we will see her we make our sad farewells and she leaves us in awe of what we have just seen and we go our individual ways to enjoy our last afternoon and evening before our return to Menorca in the morning. SATURDAY 29TH. and we are all down for the previously arranged early breakfast as we all have to be at the coach for 8.00am and our uneventful journey to Barajas and our flight back to Menorca. We say goodbye to our Members flying back to the UK at terminal 1 before the coach drops the rest of us at terminal 2. Check in and find the flight is “en punto”. We saw the flight arrive from Ibiza but, apparently, through a thunderstorm and the Captain required a full inspection of the aircraft having believed he had suffered a small lightening strike. A new aircraft was rapidly prepared and with a delay of only 60 minutes we were on our way home. We all thought that this was excellent service by Spanair in the circumstances. Altogether the 28 participating members enjoyed a splendid 6 days and our unique itinerary was especially well interpreted and arranged by Viajes Magón at a sensible price. Their choice of the Hotel Linajes and Maria as our guide was well thought out knowing that we are a group of history and culture loving Espanophiles although in hi-insight not suitable for people with walking difficulties. This is the second year that Viajes Magón arranged our November trip and we have already ideas of next years’ destination so it certainly will not be the last.